The pictures are dazzling and makes you want to start hunting for each and every piece in the book. These are not pieces that will be easy to locate. They are unique and one of a kind. So for those of you who are looking to make an exact replica, you may be disappointed to find this is not possible. However, for those of you who can improvise or use this as an inspiration to your own designs, this book will get your creative juices flowing. If you are only going to buy one beading book, this is the one to get. The book is like eye candy. It is an exquisite piece of artistry with an incredible amount of staggeringly beautiful jewelry, which can serve as inspiration for your own beading projects. 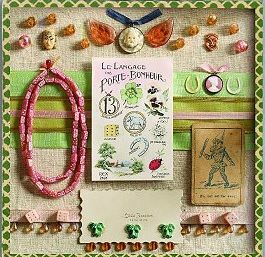 Her book and, really her whole point of view , or niche, is finding unique, vintage beads and baubles that may either serve as the centerpiece or as a lovely accompaniment to your beading designs. 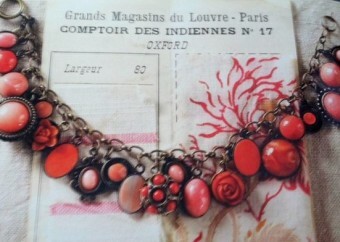 Her palette of vintage hues, or colors, is a great resource. In fact, seeing her palette cemented in my mind the types of colors to look for to get that vintage look. These colors are not easy to find in craft stores like Michael’s or Hobby Lobby, you will most definitely need to go to specialty beading stores or online stores to find these types of beads and colors. Another thing to keep in mind is that many beading stores (online or not) have a revolving door of inventory. So, if you’re looking for a bead in a specific style or color and you cannot find them anywhere, don’t give up; go back to these stores often to see if they happen to get more inventory in or, something similar. 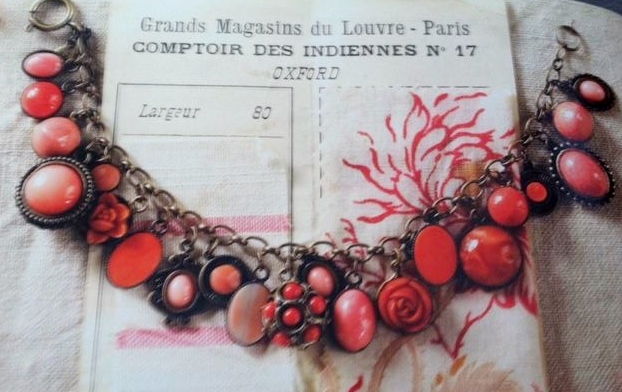 As Ms. Meng describes her own vintage bead sourcing trips in her book, the impression that she seems to give is that this book should be used as an inspiration to make your own unique creations and not necessarily a recipe that you can expect to recreate as an exact match. 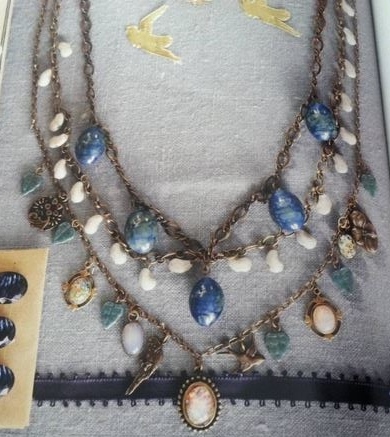 Another thing to note is that Ms. Meng does not give detailed instructions on how to make these jewelry pieces, that is not to say that she doesn’t give instructions, just that they are not extremely detailed. Having said that, if you have beading experience, you will find that the instructions are just fine. 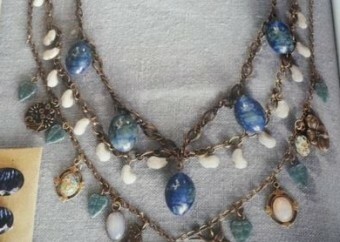 Working with the beads available to me, I was able to make an intricate and absolutely gorgeous turquoise dripping briolette necklace. (It took me forever to make, I worked on it every night for about a month but oh my, was it worth it). The book is geared towards the more experienced beader, however, there is a range of difficulty in the projects presented in this book. Obviously, some of them are very detailed and time consuming, others may not take as long (for example, rings, simple bracelets and earrings). However, I would almost consider this book as required reading for any would be beader because of the incredible color combinations and pattern ideas. The manner in which the shapes and colors of these beads are combined to make these stunning pieces is a study in beauty, and more practically, gives you great ideas on how you can combine offbeat pieces to make something truly unique. Is this book a must-have? For the beading hobbyist: Absolutely yes. This is a book that will not just sit on your coffee table, you will go back to it again and again for inspiration and instruction. 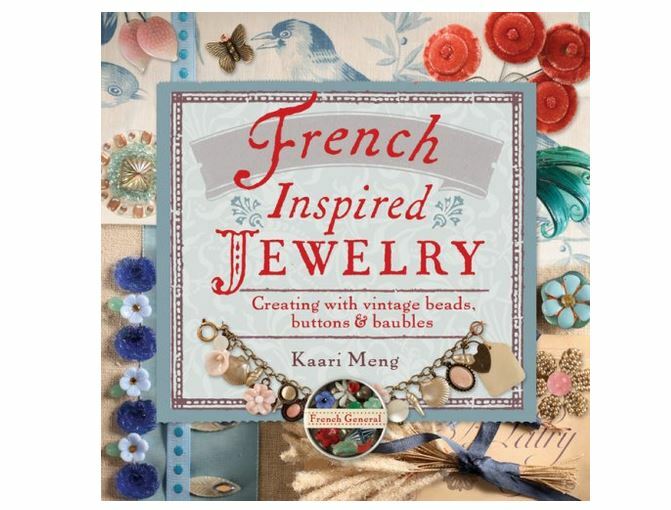 Before this book, I had purchased countless beading books and magazines, always looking for that perfect project. Since I purchased this book a couple of years ago, I have not purchased another beading book or magazine. 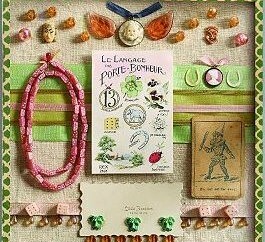 My feeling is that this is the beading book to end all books. Just about every single project in this book is my dream project; I am slowly making my way through the projects in the book. But even if you don’t wish to undertake the projects just yet, the pictures in the book are so heartbreakingly beautiful that you will want to pick up this amazing and unique book from time to time, if only to drool over the pictures and dream.